Congratulations to "Sue P.", the winner of Lynn's giveaway. Thank you to all who participated. I don't live life on the edge. My bar is set pretty low for adrenalin fixes. No need to take me rock climbing up the face of a cliff, a simple hike on paths will do. I'll pass on skydiving, too. Give me a dramatic thunderstorm with thunder and lightning booming and flashing, strong winds tossing tree limbs about, and hard rain beating down and I'm exhilarated. It's a different story for characters in my stories. I put them at the edge of physical danger, the kind that could end their lives. Being kidnapped, shot at, and knocked unconscious is just another day in the lives of heroes and heroines in my romantic suspenses. But the hard stuff I put them through is actually the emotional stuff, the crises of beliefs and challenges to patterns that have brought them to where they are in the story.I give them tough moments in which they are slammed up against the pain that has shaped their choices and they're forced to face their inner wounds or go on as they always have. These moments are life's way of offering opportunity for peace and happiness. That there is pain to embrace is why, as Clive Owen said in the movie The International, "Sometimes you find your destiny on the road you took to avoid it." These moments are where characters discover that their road to happiness requires processing the pain or settling for the same old same old in an illusion of safety and control. My characters are good at taking on serious danger, but very human in pushing away risks that seem to threaten to put them in a position of vulnerability similar to what they survived in their past by going numb or putting up walls of protection. The danger inherent in a romantic suspense is appealing to me to read because I like fast-paced action. But it's a nail-biting, intense experience for me, too, 'cause I'm not so sure the characters are going to survive. That same danger is a thrill to me to write. As a writer, I know my characters are going to conquer the bad guys and I'm right there with them. But going through their emotional growth moves me, and I'm super stoked to learn, as a pantser, how they achieve that growth. To me, a fascinating aspect of the human experience is that we have the ability to stand face to face with the wounds of the past and realize, in the throes of sorrow and pain, that things are different now. Eyes open and a different path is possible. Capable of taking down gunmen and thugs, my characters also are up to the task of making the most of second chances. I know they'll not only survive, they'll become better, more whole individuals…and of course live happily ever after. 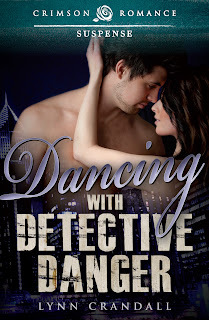 Here's an excerpt from Dancing with Detective Danger in which hero Ben Kirby and heroine Sterling Aegar wrestle with emotional pain that is an obstacle to their relationship. Ben dropped his hands to his sides and stepped off the elevator. Thoughtfully, he rubbed his thumb against his chin. The rasping of his thick beard stubble sounded crisply inside Sterling’s head, drawing her in like a bee to honey. “We found Jerry’s fingerprints on a glass in the bathroom,” he said, eyeing her as she stepped out into the night. “Well, here’s my car,” she said, stepping several feet away from Ben. Sterling pointed her remote key toward her car and put her hand on the door handle. Her hands still trembled, despite her efforts to calm herself. Nervously, she glanced over her shoulder and saw Ben standing on the other side of the lot. “You know, it seems like you’re always walking away from me,” he said, his voice low. Instantly, Sterling pivoted. “Don’t do that.” She faced him with as much composure as she could muster. “Don’t do what?” A few succinct broad strides and he closed the distance between them. Standing close, he looked down at her with such sorrow, she wished she could reach out and hold him, tell him everything would be the way he wanted it. With strong emotions seething just under her skin, it would be so easy to tell him things could be the way they used to be. Romantic suspenses are filled with intrigue. What do you enjoy most, the danger to characters' lives or the internal struggles they face? Why? Leave a comment to be eligible for a copy of Dancing with Detective Danger in your preferred format and a $10 Starbucks gift card. Find Lynn Crandall at Goodreads http://bit.ly/1bGkC64 and www.lynn-crandall.com, Facebook http://on.fb.me/13ha61C, and Twitter @lcrandall246 . What I like the most in any suspense is the unpredictability. The plot has to keep the reader at the edge and it has to take unexpected twists and turns and stay fresh, or it wouldn't be suspense. I love the premise for your book and your style. And I'm also intrigued by all the emotional aspects without turning it into a drama. All the best in your writing. Thank you! I agree, unpredictable is so fun in a story. I love the feeling of, Whoa! I didn't see that coming. I love the growth and change that takes place in a romance, and I admire you guys that can add the element of suspense to that dynamic. Good luck with your writing! Since I'm a pantser, it is super exciting to me to see how the danger develops and how the characters make choices. Thank you for sharing your thoughts! I'm such a mystery and suspense girl so the danger is what intrigues me the most. Add a bit of romance in there and I'm just really thrilled! Thanks for the post. A good mystery and suspense get my adrenaline up, reading to find out what happens next. And you're so right, add some romance and a satisfying ending and I'm blissful. I've read this book and I completely enjoyed it. Way to go, Lynn. Best wishes! sitting in my favorte reading chair. Yes, I love the reading chair adrenaline rush! Thanks for visiting. Thanks, Deborah! Traveling in time may be done best from a chair, huh? LOL! I definitely agree. I do think about time travel, but it's pretty much focused on revisiting the past to see my sons as young babies and toddlers again. Great excerpt-it makes me want to read more! I enjoy the interaction here. Thanks for visiting! And thanks for being open to new authors. I like both parts of romantic suspense but I think the danger is my favorite because you don't know when will happen next. I think that the dangers faced by the characters bring their true natures to the forefront. Together with any internal struggles makes for great reading. So I guess, I like a combination of both. Well put, Mary. Heroic actions from both places, outer and inner, make interesting stories for me. For me the internal struggle is the place I can "go" with the characters. I get hooked with both action and the emotional journey, though. Loved the post, Lynn--very well written. Needless to say, the excerpt is intriguing. I totally prefer emotional to physical--occasionally (not often, I swear) I'll skip interminable action because that's just not what interests me most. I really want to know how the characters feel, what they think... But don't tell anyone I ever skip, okay? Thanks so much for stopping by! Action can be gripping and really draw me in, but nonstop bam bam can get boring, as you suggested. LOL. My lips are sealed. I like a good mix of both. B/c like Lynn, I don't like or need to live life on the edge either, so I live vicariously through my books ;) Congrats on the new release and thanks for sharing! Balance is good, Erin. Thanks for visiting! I enjoy internal struggles... but I also like danger to the character's lives, if it doesn't seem preposterous how they get out of the situation! Loved your excerpt! Thanks for visiting! Preposterous is crazy-making, huh. Sometimes overcoming inner struggles can seem preposterous, in life and in fiction. The enfolding relationship can be as much of a nail-biter as the physical danger, even though in romance we know the outcome. Still not sure they're going to make it, though, and how! But physical danger puts the pressure on. Thank to all who visited and thank you to Maureen for a fun weekend here on Just Romantic Suspense.